What is the Jewish holiday of Rosh Hashanah? Rosh Hashanah is the Jewish New Year and commemorates the creation of the Earth. During this two day celebration, the traditional greeting “L’shanah tovah”… “for a good New Year” rings loud among members of Jewish communities. Ancient Hebrews relied upon the Torah, which celebrated it on the “seventh month” or Nisan. Passover also begins in Nisan. Today, Rosh Hashanah falls between September and October (or Tishrei). Jews believe that God weighs a person’s good and bad deeds over the previous year, and decides what the year ahead will bring. God records this information in the Book of Life. God seals this book on the festival of Yom Kippur. Rabbi Jonathan Romain, noted that the Book of Life created a ‘theological catastrophe’ that created false assumptions and blame upon God for human deeds. Romain pointed to Avot (Ethics of the Fathers) 3.19 to remind Jews of their free will and agency in decisions that impact the year ahead. Rabbi Naftali Brawer reflected that this time of year creates of a paradox of comfort and fear under God’s scrutiny. He wrote “It is frightening, because under God’s scrutiny there is no place to hide. Indeed, this is the major theme of the Days of Awe. Yet it is also comforting to know that we matter to God and that our lives and actions are of consequence“. Hence why another traditional Rosh Hashanah greeting is Gmar Chatima Tova or “Be inscribed and sealed for a good year” . Others know this holiday as Yom Teruah – or the day of the shofar blast. A synagogue ritual involves the blowing of the shofar, or a ram’s horn trumpet, a hundred notes form a special rhythm. Some fashion these horns from antelopes or ibex; but not cattle due to its association with the idolatrous Golden Calf. 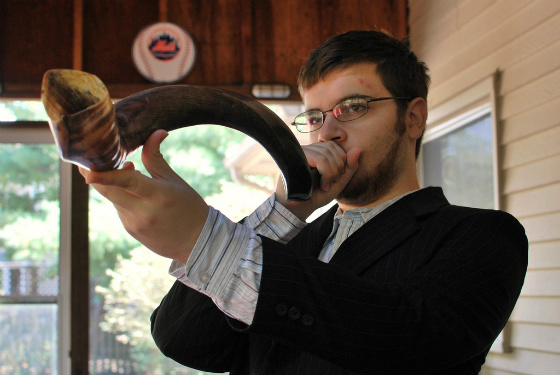 From a historical perspective, the horn reminds Jews about the binding of Isaac or a tool of intimidation in battle. Other examples of it use included the coronation of kings. Food plays an important part in Rosh Hashanah. The tradition of apples and honey dates back to the 14th century. Some Sephardi Jews avoid honey during this holiday period and substitute it for sugar. Different Jewish communities across the globe add their own nuances to dishes. With an emphasis on sweetness, a sweet carrot stew called a tzimmes is often served. Challah (Hallah) bread, baked in a round loaf, symbolises both the circle of life and year remains a customary home treat. Pomegranates, with their 613 seeds, serve as the traditional reminder of each commandment a Jews must keep. Eric King: How seriously is offline and online anti-Muslim hate taken? Why is Germany republishing Hitler's Mein Kampf? How do we include the non-religious in interfaith dialogue? Why did Tommy Robinson move from the EDL to Pegida?